So is everything now rosy under the Conservative / Liberal Democrat Coalition ? Hardly - the valuable Banksy street stencilled wall mural, which was a tourist attraction in itself, has been censored, presumably on the orders of some apparatchik at the Post Office, in spite of the fact that such Banksy stencil wall murals are worth hundreds of thousands of pounds. 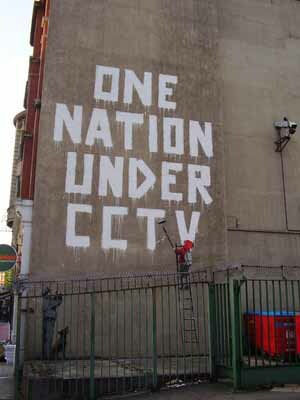 The original CCTV camera / pigeon perch which was part of the mural is still there. 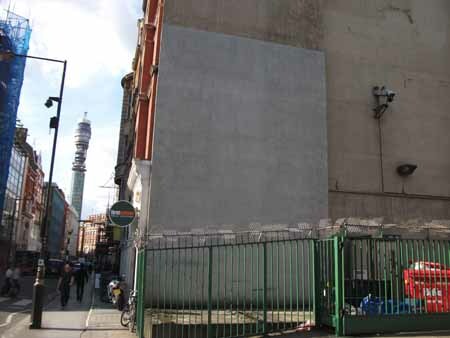 Incredibly, Westminster Council have installed a WiFi connected CCTV camera (silhouetted against the sky, to the left of the BT Tower) in this ostensible Crime Hotspot (not). Surely the Post Office is capable of paying for any extra security they deem necessary, so why did Westminster Council waste public money on this ? This seems to be a clear example of using CCTV surveillance against legitimate political and artistic protest, rather than against real crime.